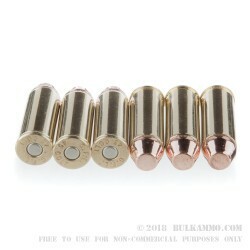 Relatively inexpensive ammunition that has a high quality build for your .45 Long Colt. 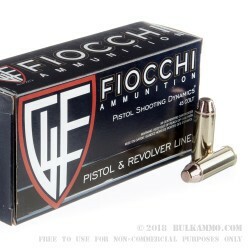 The Fiocchi .45LC 265 grain “complete metal jacket” is a hard hitting clean burning load that shoots a large, heavy projectile at 750 feet per second. The recoil for this cartridge is big, but slow and rolling, and is slightly less than what you would find normally for the round in other competitor loads. 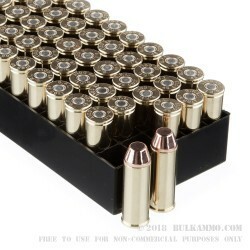 It is truly a good choice for shooting in cowboy action competitions that allow non hand-casted bullets, or for target shooting and plinking. 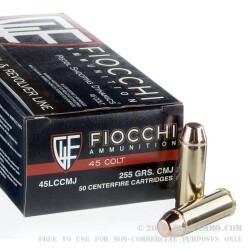 Fiocchi has a long history of offering historic cartridges in the United States; .45 Long Colt is just one of many they currently offer. The value for shooters who need reliable ammunition is high. The copper jacket offers great reduction in fouling and the Boxer primers and brass cases offer a reliability for the spent shells. This cartridge is suitable for use in all modern “.45LC” or “.45 Long Colt” marked firearms which can shoot smokeless powder. This will NOT work in .45LC Black powder or replicas. Q: I would like the ballistic characteristics of this load. A: Hello Greg, I appreciate you reaching out to us about that ammo. Fiocchi currently lists the muzzle velocity of that round at 750 fps but does not currently list a muzzle energy.